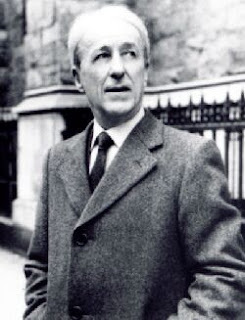 Malachi Martin (1921-1999), was an Irish Jesuit priest, professor of Palaeography at the Vatican's Pontifical Biblical Institute, well known author, and frequent guest on Art Bell's Coast to Coast radio program. To some, Martin was an expert in the subject of exorcism and the machinations of the Vatican, but to others- the more informed- Malachi Martin was a manipulative and disreputable character. Though he attempted to appear as a champion of Catholic tradition, was often considered an authority on theology, and even claimed to reveal the so-called "Third Secret of Fatima", he was anything but an orthodox Christian, as we shall see. The following is from a transcript of Coast to Coast broadcast for the date April 4-5, 1997. Art Bell: Father, may I ask you about this? If you were not a Catholic priest, but instead were a Native American, would you be a Medicine Man? And if so, a Medicine Man is, from time to time, called to drive out spirits. Malachi Martin: Yes they are. Art Bell: What are they doing, Father? Are they doing the same work, is it the same channel? Malachi Martin: I'll tell you Art what I think, now that you've asked a personal opinion of a very difficult subject, but my experience is the following and I'm not merely taking about Native Americans...I have seen such miracles of cure and restitution and de-possession worked by these people, including Native Americans--really shamans--you know, the old type. Because of my beliefs I must conclude that my Lord Jesus Christ in whom I believe and who is the source of all power, has used them in their innocence and their faith, to cure people outside the reach of a Catholic priest like me. I cannot deny that...There are people who have nothing to do with Catholicism or with some of them, Christianity. But it has worked and I've had that experience and I can't deny it. Claimed to Possess "Second Vision"
Malachi Martin: (Later in the broadcast): There were two men coming to us along the street, middle-aged men in ordinary clothes and I knew they had just committed a murder. I knew that. Art Bell: You knew that. Malachi Martin: I knew that, yes, because of the demons with them. Art Bell: You actually saw the demon with them? Malachi Martin: Yes, I do that. I, I do that. I've got second vision. When the demon is there, when the demon is in possession, yes I do. A book was written by Robert Blair Kaiser titled, Clerical Error, in which he details Malachi Martin's seduction of his wife Susan, who also happened to be pregnant with Kaiser's second child at the time the affair took place. Kaiser goes on to tell of another woman, who after being seduced by Martin, was simply dropped as if she never existed. She made contact with Martin's brother in Dublin, who told her, "I don't know you. I must tell you, you are the fourth woman who has come here asking me the same question about Malachi. All of them have essentially the same story to tell. That they were in love with Malachi, and thought he was in love with them." The woman was dumbfounded, and asked, "Four women?" Malachi's brother affirmed that, and then told her, "And one rather attractive young man." In order to bring Kaiser into disrepute, Malachi called on his friends in media and the psychiatric fields to smear Kaiser as mentally ill, which eventually resulted in Kaiser's temporary hold for evaluation. The following is taken from an investigation done by John Grasmeier of Angelqueen.org, which documents the affair. "One thing however, that is not on any record that this author knows of, is evidence of Robert being a liar. Be assured that his detractors (i.e. Martin cultists) have looked high and low. Nothing yet. Sure, they’ll accuse him of fabricating an entire book out of whole cloth, a near impossible task. However, in all 304 pages, they’ve yet to document a single untruth. The world awaits. Hence, notwithstanding any forthcoming evidence to the contrary, in writing his book, “Clerical Error,” it must be assumed that Robert is telling the truth, the whole truth and nothing but the truth. The purpose of releasing these documents is not to titillate; you’ll find none of that. Though the docs will further debunk the Malachi Martin myth, that is not even the main purpose of releasing them. The main purpose of releasing these to the world is to set the record straight and clear a man’s good name. Letter to Robert Kaiser from Father John Courtney Murray S.J. (July 10, 1964) - It is important for the reader to have some background regarding this letter. Some time before the breakup of his marriage, Bob Kaiser began to become suspicious of an affair between Martin and Kaiser’s wife Sue. To make a long story short, Martin exploited Kaiser’s suspicions, denying the relationship and accusing him of being a paranoid in need of psychiatric help. Because of the status Martin enjoyed among his fellow liberal priests, he was able to convince them in joining him in an effort to have Kaiser seek professional help. Whether or not Kaiser actually was dealing with true psychological issues – beyond those that naturally go with a man’s family being decimated - can be debated. What can’t be debated is that Fr. Murray, who had previously doubted the affair, had become completely convinced that the affair did actually happen. The letter touches on a few items relevant to the Malachi Martin saga. One being that although Father John Murray stands fast in his (non-qualified) assessment of Kaiser’s psychological state, he apologizes to Kaiser and admits that it has been made clear to him that Martin and Mrs. Kaiser were indeed having an affair. He talks about the now infamous love letters from Martin to Kaiser’s wife, “Martin’s apostasy from the Society” and the fact that he doesn’t know where Martin and Kaiser’s wife are. Letter from Father William Van Etten Casey (November 1, 1965) - This letter, written on College of the Holy Cross Stationary and signed by Fr. Casey was written to Archbishop H. E. Cardinal, the Vatican Apostolic Delegate to the United Kingdom. It’s purpose was to advocate for an annulment of the Kaiser’s marriage. I have provided a link below, where the original letters can be read. In one interview 2, Scott Peck, author of Glimpses of the Devil, called Martin a liar. Peck: In fact, Martin often was a liar. Peck: He lied about his own identity a great deal. In fact, many of the exorcism detailed in Martin's book, "Hostage to the Devil", which Martin claims were his cases, were actually performed by Scott Peck. These are just a few of the disturbing facts about Malachi Martin. Needless to say, we have to be careful about who we get our information from, and exercise discernment. Malachi Martin may have written some good materials that meet the standard of truth, but in the long run he was a man of disreputable character, and cannot be taken at face value on everything he chose to speak on as if he was an authority.